They'll do anything I tell them. Skittering along the path of the mad rat we feel a nibbling paranoia like some laced splinter of Crispin Glover’s mind in the opening sequence for Glen Morgan’s Willard. It is a nasty excavation of abstractions, from pocket knives to portraiture, of this rat paw and that rat claw burrowing deep. The malicious unseen are everywhere like some metastasizing rat king. A discussion with NIRVAN MULLICK, animation director for Willard’s opening title sequence. NM: The title sequence was produced by The Picture Mill. Mark Osborne (Kung Fu Panda, More) was scheduled to direct the sequence, but then had a scheduling conflict. Mark was my teacher at CalArts, and for some reason called me up and asked if I wanted to take over the job. Being fresh out of school and terrified, I said no, but Mark talked me into it. So this ended up being my first commercial directing job. Mark helped me estimate a budget as I had no idea how much to charge. I met with the producers, bluffed my way through a meeting, and then was off to the races. With the opening sequence you dove headlong into the small madness of angry, oppressed rats – what was your approach to directing this? 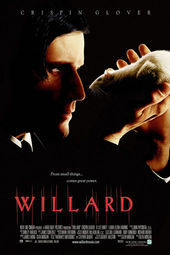 The idea was to move through Willard’s basement as if it was the character’s mind, treating the physical space as a metaphor for his mental decay. I wanted things be a little off at first, and then unravel into madness as we introduce more animated elements. We only had 2 weeks to built all the sets, puppets, and shoot the sequence, so the challenge was to find a way to create that feeling within the production limits. This sequence holds a dense diversity of process including montage, live action, collage, stop motion, clay and more. How does this diversity reveal itself to you? Gradually. The sequence starts in a seemingly real space, and then slowly moves into abstraction, finally ending in the black of a rat eye as the opening shot of the movie begins. Gravity defying water drips up from rusty pipes as the camera reaches the main title card. We then continue into an air vent- as the grate disintegrates, we let loose and begin introducing many different elements. The camera continues to move through the walls, into the drywall, the insulation, and the electrical wiring, and the inbetween spaces. The feeling of rats is everywhere, an infestation. It builds toward a breaking point. Incorporating so many techniques was a challenge, but I had a great crew that helped pull this off in a very short time. A great idea came from Rick Orner, who suggested incorporating elements of Crispin Glover’s book Rat Catching into the sequence. We called Crispin’s mom (the book’s publisher) to get permission, and got word back that Crispin thought it was a cool idea. Kathleen Lolley then made some great wall paper textures from the art in the book that were peeled layer-by-layer. The red spine of the book can also be seen in the shot with the zombie rat skeleton. This was actually a real rat skeleton made from a dead rat my friend Jonathan Silsby found downtown; he inserted small aluminum wires into the bones to make it a functional puppet for stop motion. We only had time to use stop motion sparingly, but we tried to use it in ways that amplified the creepy texture and emotional tone of the story. To what degree is your approach to the work clinical and at what point does it become emotional? The clinical side revolves around technical details, budget, and meeting deadlines. But we were all emotionally engaged with the ideas. My whole crew was excited to be bringing stop motion to the big screen, and everyone brought a lot of themselves to the project. We were only involved in creating the stop motion and live-action elements- all of the post and compositing was later handled by separate team, so we had to distance ourselves from the final piece, which was a bit frustrating. The post ended up being delayed, and then the final compositing and editing was rushed, and we later found out that we were given the wrong aspect ratio to shoot in, so a lot of our work got cropped out. It’s cool people still like the sequence, but I remember feeling a bit disappointed by the final piece, because I know it could have been better. That probably speaks to whatever emotional attachment I had. I think stop motion animators tend to invest themselves into every frame. In your opinion, how important is music and sound design for a sequence like this? Extremely. In this case, the music was done first. I listened to the music before storyboarding and fleshing out the sequence. The music set the tone and the timing for the animation and the piece as a whole. How does connectivity effect art? I believe people make unique connections based on their own perspective and experience. Everything is inherently connected, but Art succeeds for me when ideas are put together in interesting and unexpected ways. What is your take on the Surrealists and other influences on your art? When I first stumbled into experimental animation, Jan Svankmajer was a huge revelation. Surrealism and stop motion are a great fit. There is a great mix between the real and the unreal in stop motion. I’m also a big fan of Yuri Norstein, Egon Schiele, Henry Selick, Michel Gondry, and the work of micro-miniaturists like Hagop Sandalgean and Nikolai Sydristy. Are there any new artists whose work has surprised you? I’m stunned by the artists at CERN who conceived and built the Large Hadron Collider. I know it’s a physics project, but I think it’s the best collaborative experimental work of art ever. Ron Mueck and Arthur Ganson also blow me away. Street artist Blu has been doing some really cool pieces, and Jeff Lieberman’s Absolut Quartet piece is brilliant- you can find it on YouTube. In general, I’m digging art that is playing with scale, exploring new media, pushing limits, and engaging audiences in new ways. The 1 Second Film project- a non-profit collaborative movie being produced by Stephen Colbert, Kevin Bacon, Michel Gondry, Spike Jonze, and over 11,000 participants from 66 Countries. I’ve been working on it for the past 8 years, and probably have another 2 more years before it’s done.